The first time I experienced naan, I was hooked. I wanted to use it for EVERYTHING. I tore it up to dip in my soup, loaded it with spices and fresh veggies for an easy dinner, or even ate it straight out of the bag. If you’ve never tried it, it’s a bit like a cross between a pizza crust, pita bread, and a tortilla (Also known as: three of my favorite foods). This unleavened Indian bread made from wheat flour is traditionally cooked in a special oven called a tandoor, but luckily for you (and me!) it’s readily available in the bakery section of your local grocery store. 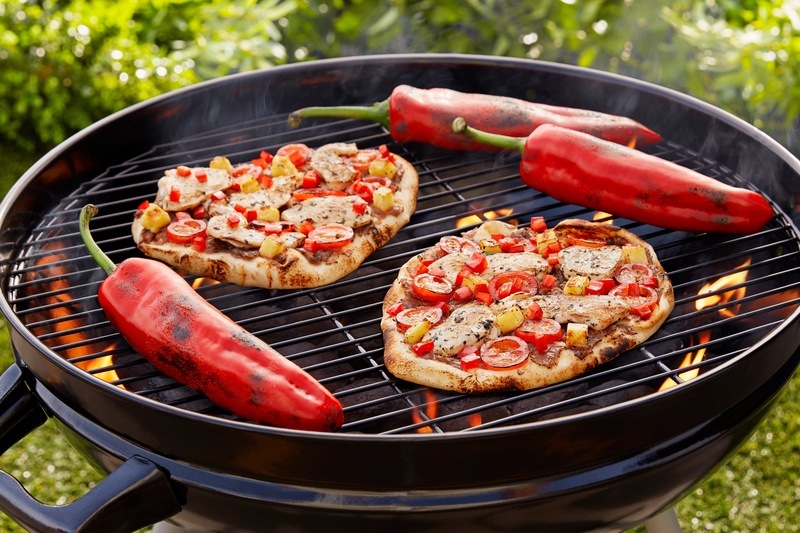 It just so happens that naan is the perfect size and doughy base for a light summer pizza, especially when thrown on the grill for crunch and an added dose of smoky flavor! The best part is, you really can’t go wrong with any toppings but this Roger Mooking recipe is definitely one that we’ll be making over and over again. Sweet, in-season pineapple combined with our juicy One Sweet® tomatoes, red onions, and a dash of oregano made having seconds a no-brainer. So fire up the grill next pizza night, and meet your new favorite summer dish. Sweet pineapple, juicy tomatoes, and herbed chicken make this a backyard favorite. Preheat grill or oven to 375F. In a large skillet over low heat, heat 1 tablespoon of vegetable oil. Cook onions for approximately 30 minutes, stirring frequently until caramelized. Add water 1 tablespoon at a time if mixture becomes too dry to avoid burning. Once cooked, pulse in a food processor until a thick paste forms but still has texture. Meanwhile, in a large bowl, combine oregano, cilantro, white pepper, salt and 2 tablespoons of vegetable oil. Place chicken breast slices in herb mixture and gently toss to evenly coat. In a large preheated skillet over medium-high heat, sear the chicken for approximately 2 minutes per side, cleaning the pan halfway through. Season pineapple slices with pepper. On a grill over medium-high heat, grill pineapple for 3 minutes per side. Remove from heat and allow to cool. Remove core and dice pineapple into ¼ inch cubes. Divide all ingredients evenly amongst the 4 naan. Start with a layer of onion paste, followed by tomato, chicken, pineapple, then peppers. On a grill over indirect heat, cook naan for 8 minutes or until crisp. Finish with kosher salt and fresh cracked pepper. © 2017 MASTRONARDI. ALL RIGHTS RESERVED.